This handheld didgeridoo is carved by artisans in Indonesia into an elegant spiral. Not to toot our own horn, but this instrument may just be the world's oldest! Indigenous Australians created the didgeridoo about 1,500 years ago, and its beguiling, drone-like sound still makes a lasting impression on listeners to this day. 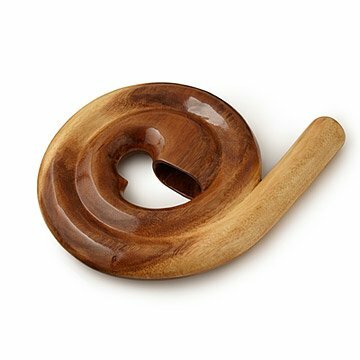 This handheld version is carved by artisans in Indonesia from beautiful suar wood into an elegant spiral. Purse your lips and blow though the instrument, and as your breath moves through the whirling passages it will make a soothing, resonant tone. With practice, you can even use this lightweight version to master the circular breathing technique, allowing you to make music without stopping to catch your breath! Handmade by artisans in Indonesia.